Justin teamed up with equally curious Colin Smith and Steve Weinik. Together, they were like The Lone Gunmen in Chris Carter’s “The X-Files,” swift in following every lead that could shed light to the identity of the tiler. Directed by Jon Foy, the documentary is involving not only because of the cryptic message of the tiles but in the way the trio discover and keep track of strands that began over ten years ago, when computers were extremely bulky and internet file transfers were painfully slow. They had three leads: the South Philadelphia address found in one of the plaques in South America, a 1983 Philadelphia Inquirer article that mentioned a specific name, and David Mamet’s play that went on to discuss dead molecules. What did it all mean? Were Justin, Colin, and Steve able to find definitive answers despite many detectives failing to solve the mystery? In a way, having concrete answers to those two questions almost did not matter to me. I found pleasure in watching these guys traveling all over the place, asking all sorts of people about what they saw or heard about the tiler, and providing their own insights as to how they thought one piece connected with another. The picture is about purpose and that longing to be a part of something quite undefinable. While it is understandable that a few might be turned off by the director’s decision to delve into Justin’s past as a student and a promising young artist, I appreciated each minute because the sequence provides a face and a personal history to a subject that is faceless and full of assumptions. I only wished that we were provided similar background information about Colin and Steve. The ethics of their investigation was eventually called into question after the trio eventually compiled a list of names. One of the men they visited lived in Philadelphia, obviously a hermit and lived a rather eccentric lifestyle. Because Justin and his partners wanted to get to the bottom of things so badly, they paid several visits, knocking on the man’s door and hollering his name. When there was no answer, they spoke to his neighbors and asked questions regarding how he was like when he did come out of the house. Afterwards, they returned to the man’s doorstep with one of his neighbors, hoping that a familiar voice would inspire the man to open his door. Still no answer. They looked up and saw a man looking scared on the second floor. There were classic signs that the man happened to live with a possible but undiagnosed mental disorder. Should the filmmakers have stopped their pursuit? 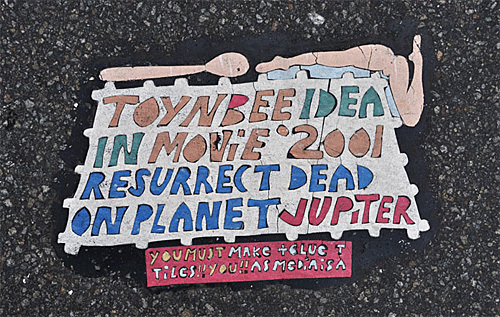 “Resurrect Dead: The Mystery of the Toynbee Tiles” is pleasantly paced. When it reaches dead ends, it isn’t frustrating or irksome. In fact, they add to the allure of the subject’s mystique. Once it ends, though answers are provided, some ineluctably inconclusive, I was still intrigued. I took a walk outside and spent some time wondering why.